One of the best hair tips I ever got was to rinse with diluted vinegar after shampooing. It sounds weird, but it works wonders. It removes shampoo residues, makes hair softer and shinier, and even works as a detangler. 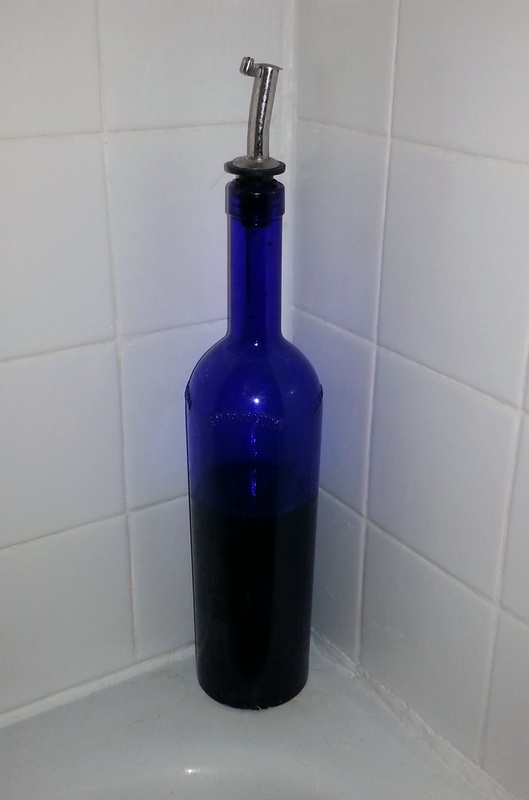 In my shower, I keep a pretty blue bottle filled with homemade cider or wine vinegar (I wrote about making cider vinegar two Fridays ago). You can also use cider vinegar from the grocery store. After shampooing and rinsing my hair, I fill a cup with water and add a couple tablespoons of vinegar. Then I tilt my head slightly back and pour the solution over my hair (the tilting is to keep vinegar out of my eyes). I usually give my hair a quick rinse with plain water, but some people prefer to leave the vinegar solution in. Doing so won’t hurt your hair, and the smell will go away as your hair dries. If the cup has disappeared from the shower, I pour a couple tablespoons of vinegar into the palm of my hand, work it through my hair, and then rinse. It’s easy, cheap, and can save you a ton of money on commercial hair conditioner. Try it and let me know if you like the results! I've tried this before but I convinced myself I could smell the vinegar all day... I presume the affect is just due to making the water more acidic so i wonder if using another mild acid (such as very dilute citric acid) will also work? Probably. I've heard of people using lemon juice, too. I have some citric acid in my pantry, maybe I'll experiment! I use ACV as a conditioner in the shower too! It's the best, I love it. I add a couple drops of lavender essential oil to the mixture, it makes for a luxurious shower :) Amazing post! Thanks! I hope it does!